Manage your time, and your right foot! 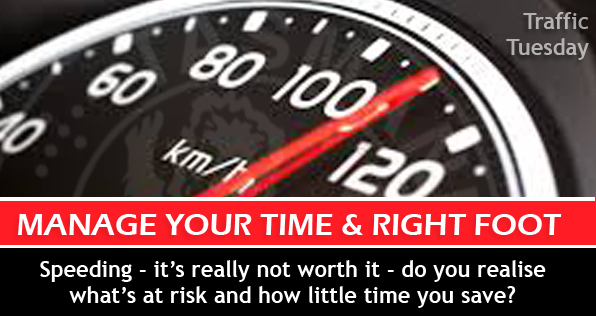 Speeding – it’s really not worth it – do you realise what’s at risk and how little time you save? > If you drove at the maximum speed limit of 110km/h for the entire journey it would take you 1.49 hours. > If you exceeded the speed limit and drove at 130km/h for the entire journey it would take you 1.32 hours. 17minutes… that’s all you would save… is 17 minutes really worth it? – Is it worth a fine of 3 points and $150? – Is it worth a car crash? – Is it worth killing or injuring yourself or someone else? – Is it worth going to prison? Manage your time and your right foot and please don’t speed. This page -- https://www.police.tas.gov.au/what-we-do/traffic-policing/traffic-tuesday/16-manage-right-foot/ -- was last published on May 1, 2017 by the Department of Police, Fire and Emergency Management.